The following is the opening for my first screenplay. Tank’s is the story of Tony, an impetuous young fish who gets snatched from his tropical homeland and transported to Tank’s, a pet shop in Rochester, NY. There, he quickly falls for Maya, a royal daughter of the salt water community, and runs afoul of the iron-finned rule of an eel named Kang. A canopy of trees extends forever to a distant range of mountains, birds swooping in and out. A break in the forest exposes a broad meandering river that empties into the sea. One bird descends to skirt along the water. Crocodiles slide from the shore, disrupting the peaceful wading of cranes who take to the air. A thicket of tree roots plunge into the river, large insects crawling along or flying amongst the gnarled roots. A squirt of water shoots up at a dragonfly, which splashes into the water, to be eaten by a large fish. Schools of fish swim among the roots. 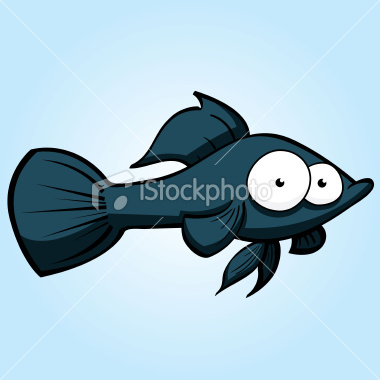 Larger fish swim alone, oblivious to the schools that scatter and reform. A cloud of bleary water blooms across the bottom of the river, causing most of the fish to scatter to the clearer upper layers. A few fish swim between the layers, trailing bleary streams. The serenity is shattered as four sleek black mollies fly by, weaving chaotically through the weeds. TONY, JUAN, RICKY and CARLOS, hyper adolescents, flip a pebble back and forth, while trying to evade tackle. Chubby Carlos swerves the wrong way, sliding into the mud and being tackled by the others. Laughing, they slowly climb out of the tangle. Carlos remains on the bottom, dazed. Hey, look! A flat fish. Tony pumps his tail to reinflate him. Juan looks to the surface, catching the waning sunlight. It’s late. Gotta go help Mom with the brood. A hundred and thirty-nine brothers and sisters and you have to help? C’mon. You’re ruining things for Carlos. He can barely speak. Tony slaps his fin over Carlos’s mouth. Hush, pal. Save your strength. Tony slowly backs away. The guys follow. Duties come later. Today is for adventure. Tony grabs Carlos by the gills. Look at this guy. Ready to grab life by the gills and kiss it on the mouth. Tony swims into a shadow. The guys stare, mouths agape. Tony looks up and comes face to face with a grinning caiman. Tony sticks a fin in the caiman’s nostrils, making it sneeze. Tony flees, pursued by the caiman. As Tony leads the merry chase, other fish scramble to safety. The caiman gets close but never quite reaches Tony. Tony suddenly favours his left fin. The caiman pounces. Tony flits aside and the caiman gets a mouthful of gravel. Tony takes off, leaving the caiman to spit out stones. This entry was posted in Comedy and tagged desire, exile, fear, fish, loneliness, love story, screenplay, screenwriting, Tank's, tropics. Bookmark the permalink. Cheers…or should I say tanks (probably not). It was a labour of love.